Just weeks before a trip intended to call for action on climate change, President Obama gave Royal Dutch Shell Oil permission to start drilling off the coast of Alaska. President Obama is winding up a tour of Alaska intended to highlight the effects of climate change and the desperate need to address it. With rapidly melting glaciers and rising sea levels that threaten to destroy whole communities, Alaska is an apt place to make the argument for swift action on climate. It is also a place where the hypocrisy of calling for action on climate change while maintaining an “all of the above” energy policy is on full display. Just weeks before the president’s trip, his administration gave Royal Dutch Shell Oil permission to start drilling off the coast of Alaska. Never mind the administration’s own studies concluding that there is a 75 percent risk of an oil spill if such offshore leases are developed; never mind that Shell made a huge mess of it last time it drilled in the region, in 2012, when it was forced to withdraw after an embarrassing series of accidents; never mind that polar bears, reindeer, and other iconic Arctic species are already under severe threat of extinction. The unavoidable damage to the climate alone should suffice to rule out further drilling in the Arctic. If humanity is to limit global temperature rise even to 2 degrees Celsius, as Obama got world leaders to agree at the Copenhagen climate summit in 2009, the science is clear: All Arctic oil—and in fact, at least two-thirds of all remaining oil, gas and coal on earth—must be left underground. To stress the contradictions in his position on drilling in the arctic, Credo compared President Obama’s trip to Alaska to President George W. Bush’s infamous “mission accomplished” speech heralding the end of the Iraq war. The group launched a website, missionnotaccomplished.com, to demand that the president not allow drilling in the Arctic. 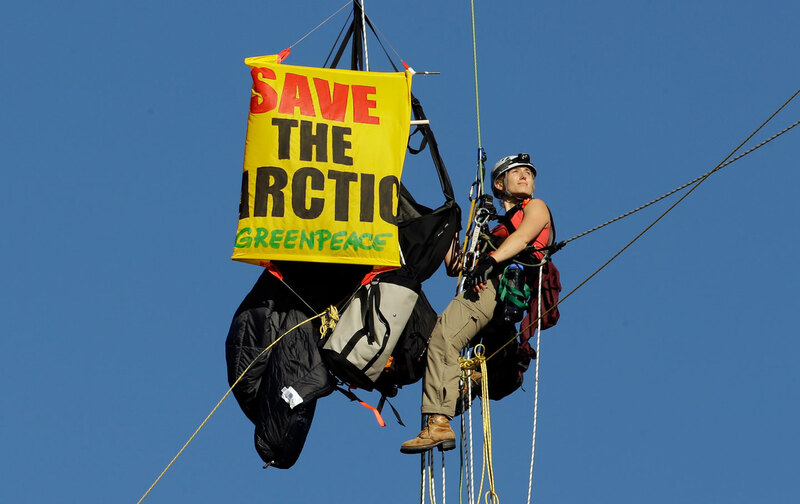 Sign the petition to tell President Obama: Climate leaders don’t drill in the Arctic.